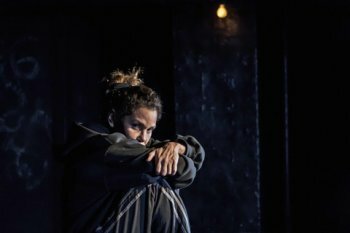 Aaron Mark’s chilling thriller, Empanada Loca, starring the talented and timeless Daphne Rubin-Vega, keeps audiences on the edge-of-their seats for a full 95 minutes. Inspired by the legend of Sweeney Todd, Empanda Loca is perfect for this spooky time of year. Rubin-Vega plays the tough and fierce Dolores, a formerly incarcerated young woman with a past of dealing drugs, now living under the tunnels of New York City and trying to piece her life back together. After being abandoned by the love of her life and partner in crime, Dominic, Delores is forced to make sense of the life she once lived with the one comfort being the corner Empanada shop – the only establishment that remains after her absence of 13 years. The owner’s son still remembers her and offers her a place to live and a space for her talent – giving massages – as she works to move on from her former life. Rubin-Vega dazzles from her first moments on stage. She is sassy and witty while sharing her life story in a raspy tone to match the mood, and maintains this intense connection with the audience the entire time. All eyes are on her as we comprehend her past and are in suspense as we see her present life unfold after learning the secrets of this empanada shop. They are unexpected and gruesome and will make the hair stand up on your head. The lighting design by Bradley King adds to the haunting atmosphere as there are moments when the light shines just right on Rubin-Vega and all you see is her face in the dark. The scenic design by David Meyer perfectly captures the dark and desolate elements of an abandoned subway tunnel, and costume advisement by Michael Growler equally does the trick. 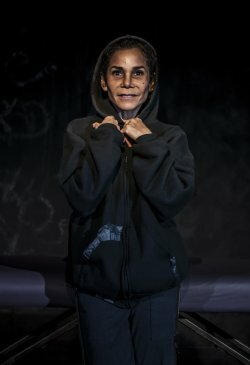 Rubin-Vega wears dark colors and brings the hood on her sweatshirt up at appropriate times to make you feel like you are seeing a floating head as she tells her tale. Playwright Mark also serves as director, and carefully executes each step of this journey. Although we never meet the supporting characters in Rubin-Vega’s story in the flesh (Dominic the love of her life; Louis, the son of the Empanada shop owner; and people from her past in prison), the audience feels as if it can imagine them on stage next to her. Her meticulous and careful description breathes life into these characters and makes her story unique. Although her past has been dark and unbelievable, Rubin-Vega adds a level of vulnerability and heart to Dolores as she is a woman struggling to make it on her own and learn how to let go of people in her past that have left scars. Empanada Loca is the exhilarating haunt you’ve been looking for. Good luck getting any sleep after viewing this exceptionally creepy piece of theater! Complicated and convoluted new play by Hamish Linklater gives a fine cast juicy roles of people all suffering from guilt. Melissa Ross’ new play is a glaring look at the human condition with a group of lost souls stuck in the past and will leave the audience with plenty to discuss at the end of the evening. Quiara Alegría Hudes (“In the Heights”) turns to a Mexican heroine who is an undocumented immigrant trying to bond with her daughter in her latest musical.